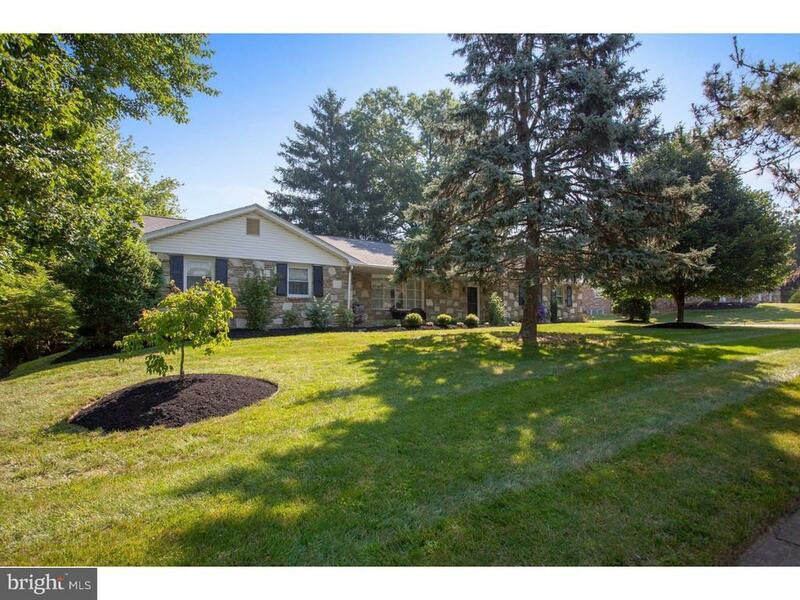 Do not miss this spacious stone and brick ranch home located in Lower Moreland Twp. in the Lower Moreland School District! This 2286 sq. ft. 3 bed, 2.5 bath home features hardwood floors, stone fireplace and spacious private layout! Enter the front door into your slate floored floyer and walk to the sun filled living room, with hardwood floors. Adjacent is the formal dining room; The open layout makes for the perfect space for entertaining! From the dining room your large eat in kitchen features updated corian countertops with a large breakfast island, recessed lighting, beautiful porcelain sink, kitchen desk, tile floors and backsplash. Off the kitchen is an updated powder room with granite counter and modern fixtures. Continuing down the hallway, is the family room, with stone fireplace, wood beamed ceiling, recessed lighting and double sliding doors to the outside covered patio. The master bedroom features his and hers closets, and a newly updated full master bath en suite with stand in shower, spacious corian vanity and tile backsplash and floors. The two additional bedrooms are spacious and the large hall bath features double vanities. Downstairs the large unfinished basement, provides ample storage, or provides plenty of opportunity to be finished to add an additional bedroom, rec room or 2nd family room! Outside your covered patio, overlooks your beautiful yard with well maintained mature landscaping, providing great privacy! This home has many recent improvements including: a new roof (2017), new A/C system (2018), new support beam in attic (2018), basement walls sealant (2018), 3 window replacements (2018) and water heater replacement (2016), new landscaping (2017). This home is conveniently located, close to the PA Turnpike and I 95 and close to shopping and restaurants! Do not miss this home in highly rated Lower Moreland School District! Schedule your appointment today!